Like building a house, the base is the most important part! It is the foundation that everything else will be built on. Take your time and plan this stage ahead of time. Having a good solid base with good drainage will give you years of enjoyment in your newly invested wood hot tub. It is truly the difference between a tub that will last 15 plus years or a tub that will be problematic and require a complete redo of the hot tub foundation in a few years. A BIG JOB once the tub is installed. The first thing to remember is that, while an empty wood hot tub weighs 400-700 lbs., but when full it can top 6,000 lbs. (8 tons!). And that's before any people are in it. With six average-size adults, your tub might push 7,500 lbs. So, you've got to make your plans with that kind of weight in mind. Keep in mind that a wood hot tub foundation will bear more weight than that of a regular acrylic hot tub. Of course building a foundation for an Ofuro Hot Tub requires much less weight support. Distance from power source: Running outdoor wire for a hot tub or gas lines can be expensive. Consider this when choosing the location! Distance and accessibility to the house: Hot tubbing is enjoyed in colder month so consider the distance you will need to cover to get back into the warm house! Privacy and View: Be sure to pick an area that is not in plain view of traffic or neighbors! Also try and choose a location that enhances your experience with some natural beauty if possible. Once you've got these preliminary aspects in hand, your next decision will be how to support the wood hot tub. If you want to place it on a raised deck in your yard we suggest you talk to a carpenter so that the proper load calculations can be used to create a deck that will support your tub. In most cases it is easier and more cost effective to place the tub foundation on the ground and build a deck around the tub. When placing the hot tub on the ground you will first need to mark out an area at least a foot wider than the outside dimensions of your hot tub. Also consider where the spa pack equipment is going to be located as this should also be marked out for proper placement of the foundation. Next you will need to remove the grass and top soil and did down to the clay or at least 1 foot. Once you have a hole created you can then add a layer of sand followed by crushed limestone or other drainage rock between 1/2"-1/4". The layer of sand will allow water to flow freely and the rock on top will provide a good solid base. Next, level the area and use a mechanical packer to ensure the base is tight. 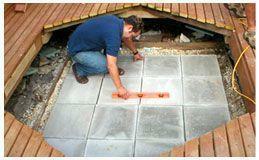 We suggest adding paving stones that come in sizes ranging from 1'x1' to 2'x2'. Place this tightly together on top of the gravel for a top layer. When done your base should extend about 6" above the surrounding area to give it plenty of slope for drainage.